I actually took this fail of an ATM frozen at the boot-up screen! Looks like a hard drive failure. 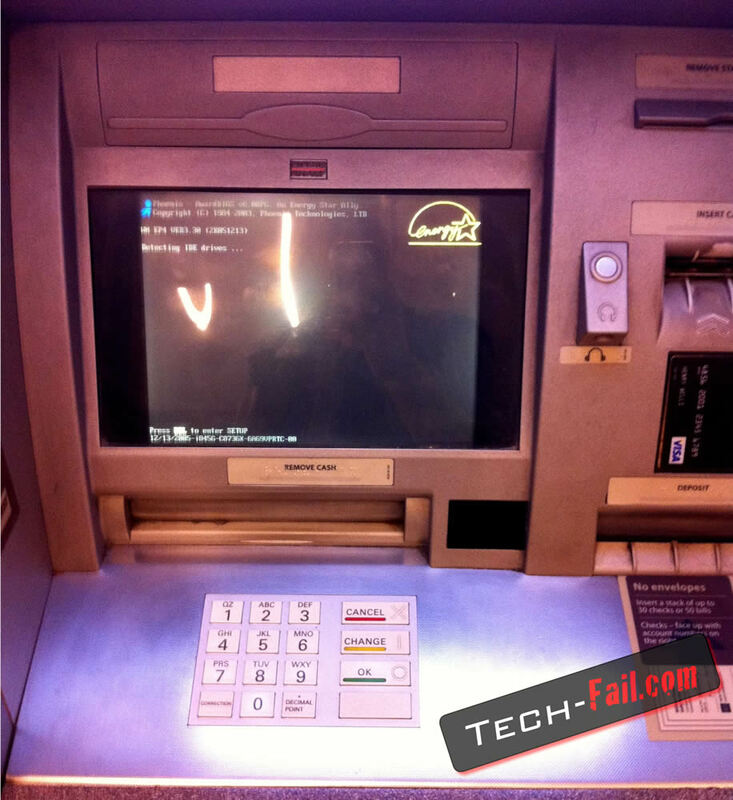 Luckily there was another ATM for me to use next to it. Since I’m on the topic of remote control vehicle fails, this one is pretty cool! With some clever editing, this could look like an actual jet crash. Ok, a bit of sensationalism there in the title…did I forget to mention it was an RC helicopter that had the electronics fail? Not sure if there is a fix for that failure. Looks pretty broken to me…just waiting for a kid to start crying and yelling at their dad. Even those of us who know and understand tech sometimes fail using it. Here podcaster Leo Laporte crashes a Ford using Active Parking Assist into another car. “You didn’t tell me that!” says Leo. I guess that’s why we have manuals! Sure, Android on tablets is a pretty new thing, but from the look of this tablet fail, something is definitely wrong. I was waiting for the Android robot to just blow up and the screen to melt. THAT would have been cool!